A multipurpose Banquet Hall in the premium Hotel Galaxy, Gurgaon! Banquet @ Hotel Galaxy is nestled in Sector 15, Gurgaon. The venue is located at a distance of 4.7 km from its nearest metro station- Huda City Centre, on the Yellow Line of DMRC. One can easily reach the venue through an 11-minutes drive from the metro station. Banquet @ Hotel Galaxy is a premium and bespoke indoor venue for your events. 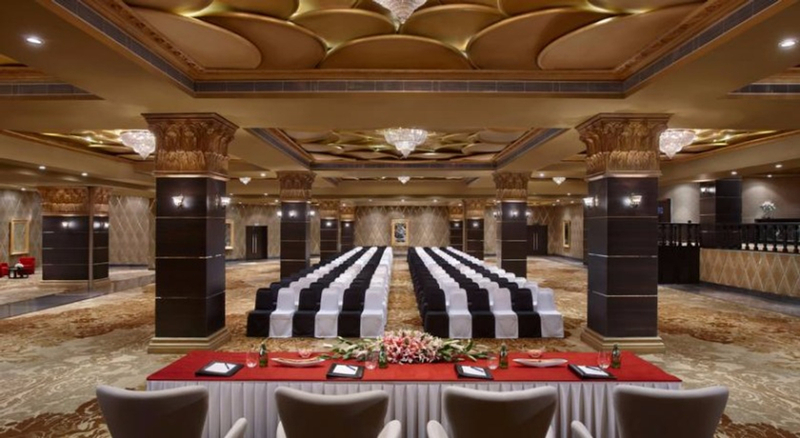 The multi-purpose banquet hall exudes grandeur with its elite entrance and comfortable lounge. With a soothing ambience and rooftop with lush green areas, the Banquet @ Galaxy Hotel is sure to impress your guests. The venue has an accommodation capacity of up to 250 guests, which makes it suitable for your medium-gathering events. Hotel Galaxy provides you with an in-house decorator to set up your desired theme for the event into the venue. Banquet @ Hotel Galaxy takes care of the entire food & beverage service of your event by providing you with an in-house team of culinary chefs. The Hotel serves a lavish variety of vegetarian and non-vegetarian food items from an array of cuisines, both Indian and international. You can choose amongst the venue's multiple menus including High-Tea Menu, Social Functions Menu, and Wedding Menu. Hotel Galaxy also serves a variety of alcoholic drinks for your cocktail events. For your outstation guests, you can choose for a comfortable stay during your event in the hotel itself. Banquet @ Hotel Galaxy is an ideal Banquet Hall for your multiple types of indoor events, including Anniversary Party, Birthday Party, Cocktail Party, Corporate Party, Engagement Ceremony, First Birthday Party, and all your Pre-Wedding Functions, Wedding Ceremony, and Wedding Reception.